They can take our Cheetos, but they can never take our FREEDOM. The war against junk food is getting surprisingly literal these days. 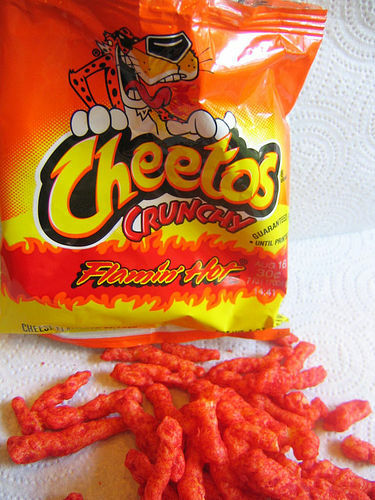 Schools across the country are moving to ban Flamin' Hot Cheetos from school property. Little kids probably should not be eating Flamin' Hot Cheetos. Nevertheless, I have to admit that I snorted laughter when I read that children are being admitted to the emergency room for stomach pains. Diagnosis: Too many Flamin' Hot Cheetos. The super-spicy treats also cause problems at the other end, if you follow me. The high amounts of artificial red color can be alarming to parents and children alike, and the burning sensation is entirely unwelcome. I'm sure kids bring plenty of unhealthy food to school, and Flamin' Hot Cheetos probably isn't the worst of it. But there will be few defenders of a food that has "26 grams of fat and a quarter of the amount of sodium recommended for a day" in one tiny snack size bag. The bright red Cheetos dust gets on everything. I mean, Cheetos dust is bad enough. But the Flamin' Hot Cheetos dust is even worse. Teachers complain about little red fingerprints getting on books, on walls, on clothes, on homework. OK, I really feel like they are reaching with this one. But it's a genuine complaint teachers are making: because kids share their Cheetos, they also swap germs. Seriously? This strikes me as a clear example of fear-mongering, but whatever. Honestly, I think it is fine for schools to ban Flamin' Hot Cheetos. Kids are only in school for part of the day, anyway. If they really want Flamin' Hot Cheetos, they can eat them before school, after school, in the middle of the night, whatever. And the rest of us adults can continue to eat them any time we want. I don't know about you, but I could really go for a bag right about now!